We at Computing at Schools are very aware that the most difficult element of including any new subject/area into the post-primary curriculum is the researching and gathering of appropriate resources. 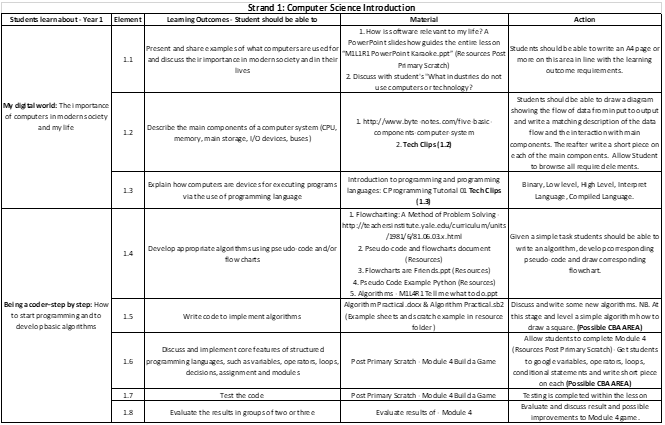 With this in mind, we have researched and developed resources that can be aligned with a number of different areas with respect to the introduction of Computer Science (CS). This resource is a collection of YouTube clips especially researched, gathered and compiled to aid post-primary teachers with the delivery of CS and covers the following topics: NB. Clips are also aligned to the roadmap for those delivering the JC Short Coding Course. 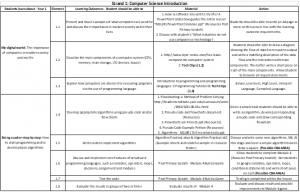 Roadmap to JC Short Coding Course – This is where the Learning Outcomes is linked to the Material & Required Actions. Strand 2 & 3 roadmaps also supplied.